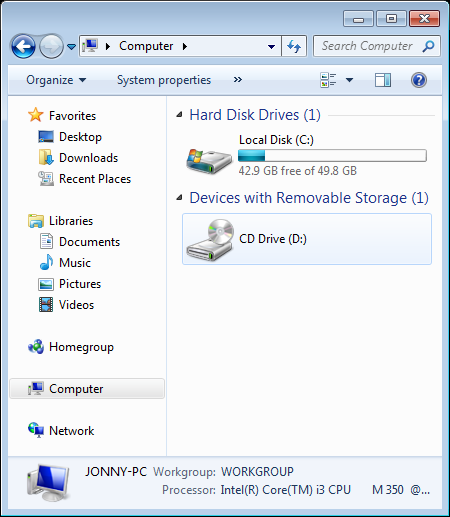 When changing the Windows Explorer view in Windows 7, you get the choice of four different icon sizes: Extra Large Icons, Large Icons, Medium Icons, and Small Icons. You also get four other choices: List, Details, Tiles, and Content. Tip – Most power users choose the Details view. Use the following steps to change the Windows Explorer View. 2 – Click on Computer. In the top right hand corner of the Windows Explorer dialog box, you will see three icons. The far right icon is the Windows Explorer help button, the middle icon allows you to toggle the view pane on and off. The icon on the left allows you to change your view within Windows Explorer. Changing the Windows Explorer View. To change the view in Windows Explorer, click on the arrow pointing downward next to the View button to display the View slider bar. Now you can drag the slider bar up and down to your desired setting. You’ll notice that as you move the bar, you can see the icons in Windows Explorer change instantly.